If you own any of the cushion compacts , this thing comes in the same exact case with the removable/refillable bottom. 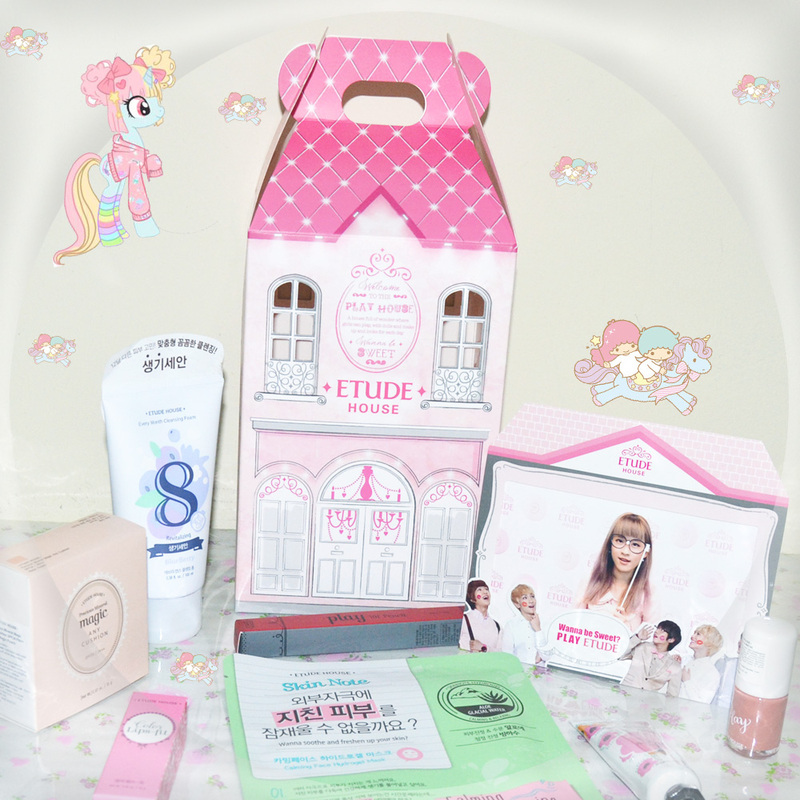 I got the pink one from Etude House Indonesia when I'm coming they first launching. This is a good product. Plus point for the packaging and smell of the product. This product conveniently cover my flaws on my face and save me a lot of time to blend it on my face! It smells good and it does not affect my sensitive skin. It's super easy to apply and coverage is pretty good Since I don't like wearing foundation or heavy coverage at all, I have to work with a really small amount in order to get the coverage I want. Packaging is adorable and for such a good quality product the price is a steal . I have sensitive oily skin and even though this feels a lbit sticky at first, it's not as dewy as other Korean makeup. I still like to set it with powder, but it's rather comfortable on the skin on its own. This Magic Cushion Pact makes skin transparent and bright with a lovely magic base color that covers imperfections of any skin type. A multi color cushion soaked in foundation, it can be bb or cc cream too , housed in a chunky compact with second lid/compartment for the puff and also to keep the foundation from drying. Step 1. Make vivid skin tone base makeup by "Magic Any Cushion"
Step 2. Dab on face for strong coverage by "Any Cushion"
Step 3. Layer along T-zone by "Magic Any Cushion"
Step 1. Make vivid and transparent skin tone by "Magic Any Cushion"
To keep skin flawless, it cares each skin's weakness via multi color cushion with whitening effect. "Moisture-Lock Fomula' is applied to prevent getting dried. Pearl mineral powder and Arbutin contained to keep skin clear and whitened, also Adenosine contained for anti-wrinkle treatment. Moisture-Lock Formula: Special formula containing Hyaluronic sodim to provent losing moisture. I wear this before my bb cream, and it does have a nice natural finish overall, but I think I'll stick to the cc cream before bb cream because I get more coverage that way. It just works better for me personally . I fell in love with the cushion compacts after trying out one of the bb cream ones and was really hoping this would do something more, but I'm not super disappointed as I knew what to expect. Perhaps when my acne scars fade more (currently working on it) it'll work better for me . Of course I'm going to finish using it, but I won't repurchase, especially at the price point it's at. It really brightens up my skin. It provides a dewy finish and when first applied looked great on me but after about 2 hours, much of it had started to disappear on the center of my face. I've also had a few clogged pores in the days after I started using it. I'm not sure if it is the cushion foundation, or something else. It is kind of sticky against the skin. That's such a cute design. You look beautiful, this is a great product! Great review I want to try it now!! This product looks really good! I love the packaging! It looks great on the skin. Estás guapìsima con ese pelo. Very curioys to try it! Great post, I usually don't use powder on my face, but a nice review! Thanks for stopping by my blog, glad I could follow you! Would love to see your follow on my blog! Looks good! Love your Make up! This looks beautiful and I love the shade. It's an interesting review! I love that makeup. I wish to find it in Argentina! suka packagingan nya, bedak nya dipaling bawah jadi ga gampang remuk kalo bedaknya jatoh..